AVC offers much more than just laser treatment, especially with an ageing population where the number of patients requiring cataract treatment is steadily rising. However, unfortunately due to NHS budget cuts, the number of procedures is falling or patients are being left for their Visual Acuity to deteriorate further before treatment can be considered. We have provided private cataract surgery alongside Lens Replacement and Implantable Contact Lens (ICL) surgery for a number of years. Our surgeons Professor Martin Filipec and Dr. Goran Helgason are two of the most well regarded IOL surgeons with over 100,00 procedures completed between them and numerous academic papers published on their work. Cataract surgery is often covered under private medical insurance and AVC are pleased to announce that we are the only independent eye clinic in the UK to be accredited by two of the UK’s leading private medical insurance providers, Aviva and Simply Health. This is the first time the accreditation has been given to a clinic outside of a private hospital environment, something AVC is exceptionally proud of. Alongside conventional monofocal cataract treatments patients have the option of paying a small fee to upgrade to Premium IOLs, including multifocals, allowing them to see both far and near without the use of spectacles. In addition, for those people who have had cataract extractions followed by monofocal lens implants, AVC can offer piggyback multifocal lenses. 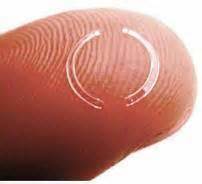 These lenses offer patients who have already had cataract operations the chance to be free from glasses too! The procedure is safe and painless so if you have any cataract patients that are frustrated by the current NHS waiting times and would prefer to have their treatment done quickly and conveniently by world leading surgeons then please do not hesitate get in touch with us. Another condition that some private medical insurance provide cover for is Keratoconus. Although treatment is available on the NHS, the types and standard of treatment available to patients can vary considerable from area to area. Cross Linking and INTACS help to stabilise the cornea and in the majority of cases will halt progression of the condition entirely. This leads patients to achieving better best corrected spectacle acuity due to a more stable cornea, and a more stable cornea leads to better contact lens fitting and the opportunity to explore surgical options such a ICL and CLE. This allows us to visually rehabilitate patients who have previously been ruled out for refractive surgery with outstanding visual results. The process is simple: if you or your patient has private healthcare with Simply Health or Aviva, a quick phone call informing them you would like AVC to carry out your cataract treatment and they will happily organise the rest. If you would like to transform your life, then why not contact AVC TODAY and request your free information pack or book your consultation to find out how we can help you.